The index looks at companies that do the best job of providing access to medications in developing countries. Johnson & Johnson ranked #2—and here’s why. More than 1,000 adolescent girls and young women are infected with HIV every day. Each year, some 200,000 people worldwide die from drug-resistant tuberculosis. And millions of children around the globe suffer from intestinal worms. Those are some startling statistics—especially when you consider the fact that many of these diseases are not only treatable but preventable. But in many parts of the world, access to life-saving medications and vaccines can be hard to come by, which is why Johnson & Johnson has made it a mission to be a leader when it comes to delivering affordable treatments to people in disadvantaged regions of the globe. And that work hasn't gone unnoticed. This week, the Access to Medicine Index, which ranks the top 20 research-based pharmaceutical companies on providing access to medicine in developing countries, recognized Johnson & Johnson’s efforts by ranking the company #2—in the world. For answers, we interviewed the man who's responsible for public health programs and access policy at Johnson & Johnson Global Public Health, Adrian Thomas Adrian ThomasVice President Global Program Strategy, Evaluation & System Policy, Global Public Health, M.D., to explain what the ranking means, how Johnson & Johnson secured a top spot on the list—and what the company still hopes to achieve in the future. Why is Johnson & Johnson such a leader in providing access to medicine in under-served regions? Adrian Thomas, M.D. : Meaningful health insurance or national coverage doesn’t exist in most developing countries, which makes affordability of life-saving medicines a real issue. We’ve helped address this by creating pricing that’s scaled to the economies of the countries that need the medications. So we provide fair prices to people in parts of the world where incomes are low and disease burden tends to be high. We also recognize the need to address poverty through donated medications where needed. 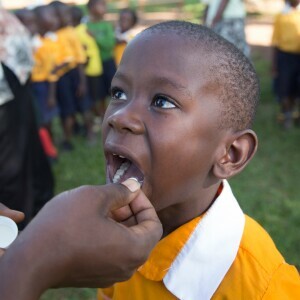 For instance, we provided over 200 million doses of mebendazole, a treatment for soil-transmitted intestinal worms, to under-served regions last year. And we developed a chewable version of the drug that was recently approved by the U.S. Food and Drug Administration to help millions of infants and young children who can't swallow pills. Thanks to our top-notch research programs and a dedicated Global Public Health organization, we're also looking at how we can better deliver targeted medications to under-served populations through partnerships in research, access, financing, policy, supply chain and local distribution and delivery. We’re involved in the global public health arena because it dovetails with our company's Credo values—and we’d continue doing it whether we were ranked #2 or #20. What do you think helped contribute to Johnson & Johnson's #2 ranking on the Access to Medicine Index? We have more than 95 products to treat different diseases on the index—that's a 50% increase over the past three years. We're one of the leaders in HIV medicines. Thanks to programs we've collaborated on, an HIV-infected woman can now give birth to an HIV-free baby. We also recently licensed a microbicide compound that's being tested for use in a vaginal ring that has the potential to prevent new HIV infections in girls and young women in Africa. Finally, if successful, an HIV vaccine we're developing could provide an important technology to end this epidemic. In addition to our HIV work, we're also developing drugs and vaccines to treat conditions such as dengue fever, Ebola and polio—as well as the first new medication for drug-resistant tuberculosis in more than 40 years, bedaquiline. All of these innovative medicines helped our ranking. These are important questions because if there are no hospitals or pharmacists in the target area, it doesn’t make sense to donate medications. So we work with local regions to make sure they have the capabilities to use the products we supply. What about the company's goals for helping even more people in the future? With innovations like our medication to treat drug-resistant tuberculosis, we’re hopeful we can continue to partner on research that could lead to eradication of the disease in the future. A half-million cases of drug-resistant TB are diagnosed each year, and it has now overtaken AIDS as the most deadly infectious disease globally, so eliminating it would be a dream come true. We also believe we can make a profound impact in the area of mental health. Schizophrenia is still largely undiagnosed in the developing world, and post-traumatic stress disorder is becoming more common because entire populations have been displaced by war. We visited a village in Rwanda where a young man with schizophrenia had been chained to a post. He was treated with a simple medication that has allowed him to lead a more normal life in the community. We'd like to be able to help more people like him who are suffering needlessly. Why is this recognition of the company's international work so important? As a physician, I believe that everyone has a right to basic medical care—poverty should not be a barrier to healthcare—so I’m gratified by the index ranking because it’s a validation of the work we are doing, alongside our partners, around the world. But it’s nice to be recognized for doing work we believe is vitally important to the health of people around the world.